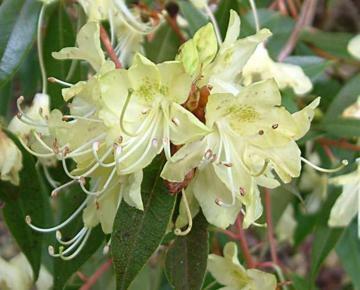 Large, graceful semi-evergreen with small lanceolate, scaly dull green leaves which are bronze-red when young. Trusses of funnel-shaped, pale primrose-yellow flowers spotted green inside, about 2.5cm across, in early spring. Flowers may be damaged by late frosts, a sheltered position is best. Discovered in China by Abbé Delavay and introduced by E.H. Wilson in 1904.